Now that people are starting to absorb the intent and motivations of the Special Counsel investigation, it’s worth remembering Robert Mueller interviewed President Donald Trump six days after the FBI launched a criminal “obstruction of justice” investigation, and ten months after the FBI launched the counterintelligence investigation…. ..The May 16, 2017, Mueller meeting with President Trump in the Oval Office. FBI Director James Comey was fired on Tuesday May 9th, 2017. According to his own admissions (NBC and CBS), Deputy FBI Director Andrew McCabe immediately began a criminal ‘obstruction’ investigation the next day, Wednesday May 10th; and he immediately enlisted Deputy Attorney General Rod Rosenstein. Recap: Tuesday-Comey Fired; Wednesday-McCabe starts criminal ‘obstruction’ case; Thursday-McCabe testifies to congress “no effort to impede”; Friday-McCabe and Rosenstein discuss Special Counsel. Now, overlaying what we know now that we did not know in 2018, to include the John Dowd interview and McCabe admissions, a very clear picture emerges. On Tuesday May 16th, Rod Rosenstein takes Robert Mueller to the White House to talk with the target of the ‘obstruction’ criminal investigation, Donald Trump, under the ruse of bringing Mueller in for a meeting about becoming FBI Director. Knowing McCabe launched a criminal obstruction investigation six days earlier (May 10th); and knowing Mueller was ineligible for the position of FBI Director; this “meeting” looks entirely different. This meeting looks like an opportunity to gather evidence for the obstruction case. Heck, perhaps this meeting was even recorded as part of the FBI investigation. McCabe did not explain why he included the detail in his book. Oh, I think I know why McCabe included the detail in his book… leverage. In combination with the ‘wear a wire’ comments, McCabe’s stealth book note is a shot across the bow to Rod Rosenstein and Robert Mueller. Only the insider ‘small group’ would understand what McCabe is threatening. It’s a get out of jail free card that McCabe played to escape the clutches of the 2018 DC criminal referral. And it looks like it worked. This would explain why DC U.S. Attorney Jessie Liu dropped the case against McCabe? I digress… but can you see how obvious this is? The next day, Wednesday May 17th, 2017, Rod Rosenstein and Andrew McCabe go to brief the congressional “Gang-of-Eight”: Paul Ryan, Nancy Pelosi, ¹Devin Nunes, Adam Schiff, Mitch McConnell, Chuck Schumer, Richard Burr and Mark Warner. Immediately following this May 17, 2017, Go8 briefing, Deputy AG Rod Rosenstein notified the public of the special counsel appointment. According to President Trump’s Attorney John Dowd, the White House was stunned by the decision. [Link] Coincidentally, AG Jeff Sessions was in the oval office for unrelated business when White House counsel Don McGahn came in and informed the group. Jeff Sessions immediately offered his resignation, and Sessions’ chief-of-staff Jody Hunt went back to the Main Justice office to ask Rosenstein what the hell was going on. The DOJ (Rosenstein) and FBI (McCabe) activity in coordination with the Robert Mueller team was always about the obstruction case from day one; heck, from even before Robert Mueller was appointed. It could not be any more clear than it is today. Mueller’s investigative ‘small group’ were the people inside Main Justice (DOJ) and FBI headquarters who redacted the Lisa Page and Peter Strzok text messages, and removed messages and communication antithetical to their goals. As Devin Nunes outlined recently the Mueller team also kept key documents and information away from congress; stalled any effort to expose the unlawful aspects of “SpyGate’ and the fraudulent foundation behind the Carter Page FISA application; and undermined any adverse discoveries in the leak investigations (James Wolfe) writ large. This investigative small group didn’t change when Mueller arrived, they just retooled the focus of their effort based on new leadership and new objectives. Those who created the Trump-Russia collusion/conspiracy case of 2016, evolved into creating the Trump obstructing justice case of 2017, 2018 and 2019. Everything Mueller and Rosenstein were doing in late 2017 and throughout 2018 was intended to drag-out the Russia conspiracy narrative as long as possible, even though there was no actual Trump-Russia investigation taking place. It was always the “obstruction” investigation that could lead to the desired result by Mueller’s team of taking down President Trump through evidence that would help Pelosi and Nadler achieve impeachment . The “obstruction case” was the entirety of the case they were trying to make from May 2017 through to March 2019. [¹] Now we know why House Speaker Paul Ryan moved to sideline Devin Nunes under the cloud of an ethics investigation. Representative Jim Jordan and Representative Mark Meadows appear on Fox News to discuss the Mueller report. In response to media inquiry and FOIA demands, the government of Australia formally admitted today to the role of High Commissioner Alexander Downer and his engagements with George Papadopoulos in 2016. The timing coincides with the Mueller Report (released today), which states it was information about this engagement from Alexander Downer that opened the FBI counterintelligence investigation in July 2016. The Australian government cited the conclusion of the Robert Mueller special counsel investigation as the background for their willingness to comply with an 15-month-old FOIA request from Buzzfeed News. Alexander Downer is the Australian diplomat who engaged George Papadopoulos in London just days after U.S. intelligence asset Joseph Mifsud told Papadopoulos that Russians had emails from Hillary Clinton. In 1956, Australia — alongside New Zealand — were both added to the newly expanded UKUSA Agreement, which extended intelligence co-operation to those two countries with the current members of the agreement — United Kingdom, United States and Canada — which formed the alliance known as “Five Eyes”. Many years later, on February 22, 2006, Alexander Downer and Bill Clinton signed a memorandum of understanding to spread grant money over the course of four years to a project to provide screening and drug treatment to AIDS patients in Asia as part of the Clinton Foundation. On February 18, 2014, Downer was announced as Australia’s next High Commissioner to London, where he would replace Mike Rann. Between March 7–13, 2016, Director James Comey visited Australia and met with Attorney General George Brandis and Justice Minister Michael Keenan. Three days later, on March 16, Director James Clapper arrived in Australia from New Zealand via a C-17 Globemaster. On May 10, 2016, at the Kensington Wine Rooms in London, England, Downer met with George Papadopoulos, where Papadopoulos — having been introduced through two intermediaries, Christian Cantor and Erika Thompson — mentioned that Russians had material on Hillary Clinton. Alexander Downer decided to inform the United States Embassy in London, England about his conversation with Papadopoulos, upon the release of the Democratic National Committee’s e-mails by WikiLeaks on July 22, 2016. Note: I cannot reconcile the disparity in date of May 6th, 2016 (Mueller) -vs- May 10th/11th, 2016 (Downer). On July 23, 2016, the Australian Government contacted Elizabeth Dibble at the United States Embassy to inform her about Downer and Papadopoulos’s conversation. Somehow the information was transmitted to the Federal Bureau of Investigation. Crossfire Hurricane was then opened on July 31, 2016 by the Federal Bureau of Investigation. Two days later, on August 2, 2016, Special Agent Peter Strzok and another agent at the Federal Bureau of Investigation met with Downer directly in London to discuss his conversation with Papadopoulos further. Strzok then received reading materials, which he texted about to Lisa Page. REPRESENTATIVE DEVIN NUNES: “That’s correct. So it took us a long time to actually get this, what’s called the “electronic communication”, as we know it now for your viewers, what it is it’s the original intelligence, original reasons that the counterintelligence was started. Now this is really important to us because the counterintelligence investigation uses the tools of our intelligence services that are not supposed to be used on American citizens. And we’ve long wanted to know: what intelligence did you have that actually led to this investigation? So what we’ve found now, after the investigators have reviewed it, is that in fact there was no intelligence. So we have a traditional partnership with what’s called the Five Eyes Agreement. Five Eyes Agreement involves our friends in Australia, New Zealand, the United Kingdom, Canada, and of course, us. So long time processes and procedures in place where we move intelligence across. We are not supposed to spy on each others’ citizens. And it’s worked well. And it continues to work well. And we know it’s working well because there was no intelligence that passed through the Five Eyes channels to our government. Also, during a MAGA Rally in Las Vegas, NV on September 20, 2018, when President Donald Trump was interviewed by Sean Hannity, the President mentioned that two foreign governments were attempting to block the declassification of the FISA on Carter Page. We already know Cambridge Professor Stefan Halper is a U.S. intelligence asset used to run an operation against Carter Page. If Joseph Mifsud is shown to be a U.S. (or Western) intelligence asset; not Russian; and he planted the Clinton email story on Papadopoulos, then the make-up of the operation to frame Papadopoulos is solidified. Downer would be used to extract the information planted by Mifsud; giving the appearance of Russian influence. The scale of internet bandwidth being used to view this 448-page report is incredible. Allow time for visibility or any download/upload. Feel free to drop your comments on review below. CTH will have full analysis after a thorough review. A much anticipated press conference today with Attorney General Bill Barr and Deputy Attorney General Rod Rosenstein as they release the report from Special Counsel Robert Mueller. When the actual report is released we can FIND IT HERE. [Transcript of prepared remarks] Good Morning. Thank you all for being here today. At 11:00 this morning, I will transmit copies of a public version of the Special Counsel’s report to the Chairmen and Ranking Members of the House and Senate Judiciary Committees. The Department of Justice will also make the report available to the American public by posting it on the Department’s website after it has been delivered to Congress. I would like to offer a few comments today on the report. But before I do that, I want to thank Deputy Attorney General Rod Rosenstein for joining me here today and for his assistance and counsel throughout this process. Rod has served the Department of Justice for many years with dedication and distinction, and it has been a great privilege and pleasure to work with him since my confirmation. He had well-deserved plans to step back from public service that I interrupted by asking him to help in my transition. Rod has been an invaluable partner, and I am grateful that he was willing to help me and has been able to see the Special Counsel’s investigation to its conclusion. Thank you, Rod. I would also like to thank Special Counsel Mueller for his service and the thoroughness of his investigation, particularly his work exposing the nature of Russia’s attempts to interfere in our electoral process. As you know, one of the primary purposes of the Special Counsel’s investigation was to determine whether members of the presidential campaign of Donald J. Trump, or any individuals associated with that campaign, conspired or coordinated with the Russian government to interfere in the 2016 election. I am sure that all Americans share my concerns about the efforts of the Russian government to interfere in our presidential election. As the Special Counsel’s report makes clear, the Russian government sought to interfere in our election. But thanks to the Special Counsel’s thorough investigation, we now know that the Russian operatives who perpetrated these schemes did not have the cooperation of President Trump or the Trump campaign – or the knowing assistance of any other Americans for that matter. That is something that all Americans can and should be grateful to have confirmed. First, the report details efforts by the Internet Research Agency, a Russian company with close ties to the Russian government, to sow social discord among American voters through disinformation and social media operations. Following a thorough investigation of this disinformation campaign, the Special Counsel brought charges in federal court against several Russian nationals and entities for their respective roles in this scheme. Those charges remain pending, and the individual defendants remain at large. But the Special Counsel found no evidence that any Americans – including anyone associated with the Trump campaign – conspired or coordinated with the Russian government or the IRA in carrying out this illegal scheme. Indeed, as the report states, “[t]he investigation did not identify evidence that any U.S. persons knowingly or intentionally coordinated with the IRA’s interference operation.” Put another way, the Special Counsel found no “collusion” by any Americans in the IRA’s illegal activity. Second, the report details efforts by Russian military officials associated with the GRU to hack into computers and steal documents and emails from individuals affiliated with the Democratic Party and the presidential campaign of Hillary Rodham Clinton for the purpose of eventually publicizing those emails. Obtaining such unauthorized access into computers is a federal crime. Following a thorough investigation of these hacking operations, the Special Counsel brought charges in federal court against several Russian military officers for their respective roles in these illegal hacking activities. Those charges are still pending and the defendants remain at large. But again, the Special Counsel’s report did not find any evidence that members of the Trump campaign or anyone associated with the campaign conspired or coordinated with the Russian government in its hacking operations. In other words, there was no evidence of Trump campaign “collusion” with the Russian government’s hacking. The Special Counsel’s investigation also examined Russian efforts to publish stolen emails and documents on the internet. The Special Counsel found that, after the GRU disseminated some of the stolen materials through its own controlled entities, DCLeaks and Guccifer 2.0, the GRU transferred some of the stolen materials to Wikileaks for publication. Wikileaks then made a series of document dumps. The Special Counsel also investigated whether any member or affiliate of the Trump campaign encouraged or otherwise played a role in these dissemination efforts. Under applicable law, publication of these types of materials would not be criminal unless the publisher also participated in the underlying hacking conspiracy. Here too, the Special Counsel’s report did not find that any person associated with the Trump campaign illegally participated in the dissemination of the materials. Finally, the Special Counsel investigated a number of “links” or “contacts” between Trump Campaign officials and individuals connected with the Russian government during the 2016 presidential campaign. After reviewing those contacts, the Special Counsel did not find any conspiracy to violate U.S. law involving Russia-linked persons and any persons associated with the Trump campaign. So that is the bottom line. After nearly two years of investigation, thousands of subpoenas, and hundreds of warrants and witness interviews, the Special Counsel confirmed that the Russian government sponsored efforts to illegally interfere with the 2016 presidential election but did not find that the Trump campaign or other Americans colluded in those schemes. After finding no underlying collusion with Russia, the Special Counsel’s report goes on to consider whether certain actions of the President could amount to obstruction of the Special Counsel’s investigation. As I addressed in my March 24th letter, the Special Counsel did not make a traditional prosecutorial judgment regarding this allegation. Instead, the report recounts ten episodes involving the President and discusses potential legal theories for connecting these actions to elements of an obstruction offense. After carefully reviewing the facts and legal theories outlined in the report, and in consultation with the Office of Legal Counsel and other Department lawyers, the Deputy Attorney General and I concluded that the evidence developed by the Special Counsel is not sufficient to establish that the President committed an obstruction-of-justice offense. Although the Deputy Attorney General and I disagreed with some of the Special Counsel’s legal theories and felt that some of the episodes examined did not amount to obstruction as a matter of law, we did not rely solely on that in making our decision. Instead, we accepted the Special Counsel’s legal framework for purposes of our analysis and evaluated the evidence as presented by the Special Counsel in reaching our conclusion. Yet, as he said from the beginning, there was in fact no collusion. And as the Special Counsel’s report acknowledges, there is substantial evidence to show that the President was frustrated and angered by a sincere belief that the investigation was undermining his presidency, propelled by his political opponents, and fueled by illegal leaks. Nonetheless, the White House fully cooperated with the Special Counsel’s investigation, providing unfettered access to campaign and White House documents, directing senior aides to testify freely, and asserting no privilege claims. And at the same time, the President took no act that in fact deprived the Special Counsel of the documents and witnesses necessary to complete his investigation. Apart from whether the acts were obstructive, this evidence of non-corrupt motives weighs heavily against any allegation that the President had a corrupt intent to obstruct the investigation. Now, before I take questions, I want to address a few aspects of the process for producing the public report that I am releasing today. As I said several times, the report contains limited redactions relating to four categories of information. To ensure as much transparency as possible, these redactions have been clearly labelled and color-coded so that readers can tell which redactions correspond to which categories. As you will see, most of the redactions were compelled by the need to prevent harm to ongoing matters and to comply with court orders prohibiting the public disclosure of information bearing upon ongoing investigations and criminal cases, such as the IRA case and the Roger Stone case. These redactions were applied by Department of Justice attorneys working closely together with attorneys from the Special Counsel’s Office, as well as with the intelligence community, and prosecutors who are handling ongoing cases. The redactions are their work product. Consistent with long-standing Executive Branch practice, the decision whether to assert Executive privilege over any portion of the report rested with the President of the United States. Because the White House voluntarily cooperated with the Special Counsel’s investigation, significant portions of the report contain material over which the President could have asserted privilege. And he would have been well within his rights to do so. Following my March 29th letter, the Office of the White House Counsel requested the opportunity to review the redacted version of the report in order to advise the President on the potential invocation of privilege, which is consistent with long-standing practice. Following that review, the President confirmed that, in the interests of transparency and full disclosure to the American people, he would not assert privilege over the Special Counsel’s report. Accordingly, the public report I am releasing today contains redactions only for the four categories that I previously outlined, and no material has been redacted based on executive privilege. In addition, earlier this week, the President’s personal counsel requested and were given the opportunity to read a final version of the redacted report before it was publicly released. That request was consistent with the practice followed under the Ethics in Government Act, which permitted individuals named in a report prepared by an Independent Counsel the opportunity to read the report before publication. The President’s personal lawyers were not permitted to make, and did not request, any redactions. In addition to making the redacted report public, we are also committed to working with Congress to accommodate their legitimate oversight interests with respect to the Special Counsel’s investigation. We have been consulting with Chairman Graham and Chairman Nadler throughout this process, and we will continue to do so. Given the limited nature of the redactions, I believe that the publicly released report will allow every American to understand the results of the Special Counsel’s investigation. Nevertheless, in an effort to accommodate congressional requests, we will make available to a bipartisan group of leaders from several Congressional committees a version of the report with all redactions removed except those relating to grand-jury information. Thus, these members of Congress will be able to see all of the redacted material for themselves – with the limited exception of that which, by law, cannot be shared. I believe that this accommodation, together with my upcoming testimony before the Senate and House Judiciary Committees, will satisfy any need Congress has for information regarding the Special Counsel’s investigation. Once again, I would like to thank you all for being here today. I now have a few minutes for questions. The anticipated start time for the press conference is 9:30am EST; with the release of the Mueller report around 11:00am to Noon at the Special Counsel website HERE. This will not come as a surprise to anyone who has followed closely; however, according to the FBI’s primary narrative engineer, Devlin Barrett at the Washington Post, the Mueller team has invested most heavily in “obstruction, obstruction, obstruction”…. For two years 19 lawyers were piecing the script together; while 40 FBI agents used 2,800 subpoenas, 230 orders for communication records, national security letters, FISA authorization, wiretaps, 50 pen register authorizations, and over 500 Title III search warrants to scour the background of every private communication, phone call, text message and email of everyone in the Trump orbit. Eventually interviewing over 500 witnesses for words to paste into the text of the Mueller/Weissmann obstruction report. As Barrett outlines on behalf of his benefactors, the team has painted a detailed narrative using every word, tweet, media interview, comment, and private/confidential White House utterance by President Trump -about his unhappiness with the Mueller probe- as clear and convincing evidence of President Trump’s intent to obstruct the investigation. It’s all about the “obstruction”…. And that is Pelosi’s launch platform. (WaPo Via Devlin Barrett) The Justice Department plans to release a lightly redacted version of special counsel Robert S. Mueller III’s 400-page report Thursday, offering a granular look at the ways in which President Trump was suspected of having obstructed justice, people familiar with the matter said. The report — the general outlines of which the Justice Department has briefed the White House on — will reveal that Mueller decided he could not come to a conclusion on the question of obstruction because it was difficult to determine Trump’s intent and because some of his actions could be interpreted innocently, these people said. The White House approach to this is visible on the perimeter. Classic Trump and it will catch the Moonbats completely off-guard. Put it all out there…. All of it. As much as possible…. let the world see just how much effort was expended on this stupid investigation into nothing. This is classic Trump. Trump owns the downside better than anyone. No-one, EVER, has yet to catch on to how brilliantly Trump owns the downside. The report will outline how many times terrible Trump lashed out over the past two years to his closest advisers about the damn “witchhunt”. It will outline every time he asked someone if he could do something to stop it… It will outline everything about how Trump wanted that damned ridiculous investigation to be done with… etc. etc. etc. However, in releasing so much granular activity the one thing the Mueller team and the media will forget is…. that’s exactly the behavior of a transparently innocent man. Wrongfully accused…. that’s what you do. And you know what, Trump will own it. Trump will own it in the very Trumpiest of ways. Yes, I said that… I was, and am still, furious that we have had to put up with this nonsense; with this garbage… it’s infuriating. etc. etc. etc. in buckets. In the way only POTUS Trump can deliver. In the words of a common man. In the words of every man. In the words that almost every American will relate to. That’s how Trump will do it. Authentically and naturally…. he will completely own his willingness to shut down that stupid Russia collusion nonsense. Two years of fire-breathing dragon-energy Trump.. unleashed. Regardless of who you supported in the 2016 Presidential primary race, most will admit there’s one strategic advantage held by Donald Trump over all other candidates – Trump’s willingness to “own the downside“. All policies and proposals have a “downside“, there’s no such thing as a policy proposal with benefit to all and harm to none. This empirical truth is toxic to professional politicians – therefore they spend an inordinate amount of time using pretzel logic to avoid it. As a direct consequence of avoidance, the media love to use the downside as a weapon. For the first time in recent political memory Donald Trump represents a candidacy who is unafraid of their spear; and as a consequence, immune to the damage. A case in point – NBC’s Chuck Todd thought he could deploy the downside weapon during a Trump campaign stop in Iowa (State Fair). During the exclusive interview aboard the Trumpo Jet Todd deployed his arsenal – “but you can’t actually remove illegal immigrants, I mean you can’t actually deport them“. Trump owned the downside. “Chuck, yes, yes we will. Either we have borders or we don’t; either we have a country or we don’t“. Not Trump, he owns the downside. This approach is what makes ‘Splodey Heads! A Second Case In Point – Trump does it again with CNN’s Jake Tapper, only this time Trump frames the controversial position ownership with an explanation. Donald Trump is backing up his previous position that removing Iraq’s Sadam Hussein and Libya’s Kaddaffi was not a good idea. Jake Tapper is aghast: “what about the human rights abuses”? It doesn’t matter what the issue is. Media: Jeb Bush want’s a no-fly zone in Syria? Trump: When did ISIS get airplanes? Media: You can’t build a wall? Trump: I build things, that’s what I do – watch me! Media: You’re going to deport 11 million people. You’ll need a “deportation force“. Trump: What does I.C.E do? And on and on it goes. Simple cut-to-the-chase responses with total fearless ownership of any downside from a policy proposal. Media: But you used to be a Democrat, you have donated to Democrats? Trump: Yes, I live and work in New York. NYC is all Democrats, if I need to leverage assistance for my company goals I need to work with Democrats. It’s a business necessity; I look out for my employees and their best interests. Media: But you had Hillary Clinton at your wedding? Trump: Yes, it was an amazing event, the best, the biggest, the most elegant, and I asked her and Bill to attend. They did. Wouldn’t you, I mean if I invited you? Media: You spend all this time talking about polls. You seem obsessed by polls? Trump: Yeah, that’s because I’m winning them. If the polls were not good, I wouldn’t even mention them. Duh. Media: You can’t build a wall! Media: But you support Eminent Domain? Trump: Yeah, and “Try building the Keystone Pipeline without it”..
Media: But you called Sanders a maniac! Trump: “And a Communist”, don’t forget! Media: But you declared bankruptcy! Media: But you held a rally and someone said Obama was Muslim, and you didn’t defend him from it! Trump has spent decades with Park Row media types. He has never avoided them, he totally understands how they operate – and more importantly “why”? Pelosi and Mueller’s team think they’ve got him surrounded with Mueller’s team. Except they’ve forgotten… He’s seemingly one man, yet he consistently has his opposition surrounded. Watch President Trump own the downside to this Mueller report… it’s going to be a thing of absolute beauty…. yet again. Democrat politicians and their water-carrying media allies who helped spur the Mueller investigation for two years are furious about Attorney General Bill Barr and Deputy AG Rod Rosenstein holding a press conference tomorrow (9:30am) shortly before releasing the Mueller report (11:00am). The battle over illegal aliens in the United States will really make your head spin. 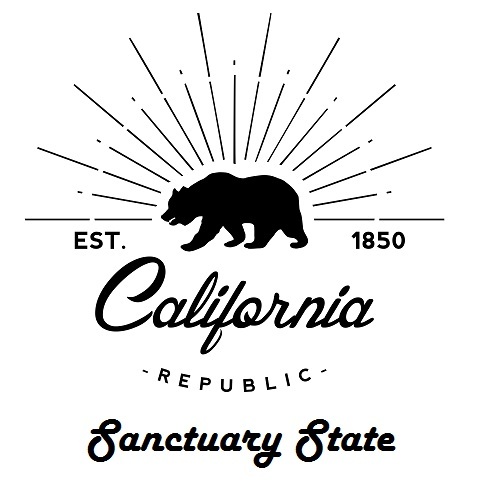 In 2017, California passed a “sanctuary state” law that limits cooperation between local authorities and federal immigration officials. Trump has stated that it remains an option for his administration to dump undocumented immigrants in “sanctuary cities,” namely send them all to California and let them pay for them. What is really amazing is that California can’t even manage its own state pensions. He has been secretly lobbying Washington to seize all private 401Ks and hand them to CALPERS to manage. That way, they can take the profits of private pensions and hand them to state employees. There is a danger that California could simply pass a law to allow that in their state without a federal law. That will, no doubt, prompt a lawsuit under the Taking Clause of the Fifth Amendment. If they cannot manage their own budget, how will they fund all the illegal aliens? Trump should just send them all to California and let this social experiment educate the world. It is interesting how rich liberals from California just so happen to be moving quietly out of the state to avoid the taxation. Even Scientology moved its headquarter to Florida, as have some of their more famous members. QUESTION: Martin Today is Palm Sunday. In mass, they said HE colluded with the Galilean’s. HE was found innocent by the Council. They said HE was a tax evader. HE was found innocent by new leadership. HE correctly predicted that HE would be denied by his own party 3 times. The corrupt crowd lobbied to release a murderer, and sentence an innocent man to his fate. My question is do cycles go beyond what is physical as with planets and the stars that wobble and rotate around our galaxy? Does it include emotional and human behavior cycles? Does history rhyme? If so, are we living in a matrix that has been programmed with numerous cycles? We can show that animal life is irreducibly complex and therefore predesigned. But, I am now wondering about if the psychic has been programmed with cycles too? Do we truly have free will? ANSWER: Your question is interesting. 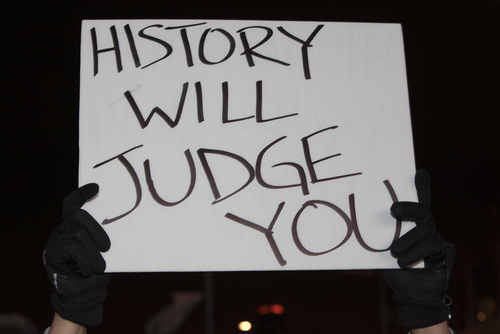 I have usually explained that history repeats because human nature never changes. Only technology does. Given the same circumstances, humans will ALWAYSrespond in the same manner. Just examine the same facts and you will see how there is NEVER any rule of law. It does not matter what century, for it is always the same. It is all a joke. Whatever the desire of those in power, they will always manipulate the law to produce the desired outcome. Right now, just look at the government throwing Chelsea Manning in prison on contempt indefinitely, the $4.2 billion handed to Ecuador for Assange by the IMF, and then his immediate indictment and move for extradition. This is all a coordinated attack to launch against Trump for the 2020 election after the Mueller Report failed. There are NO COINCIDENCES when it comes to political maneuvers. You are watching history in the making. 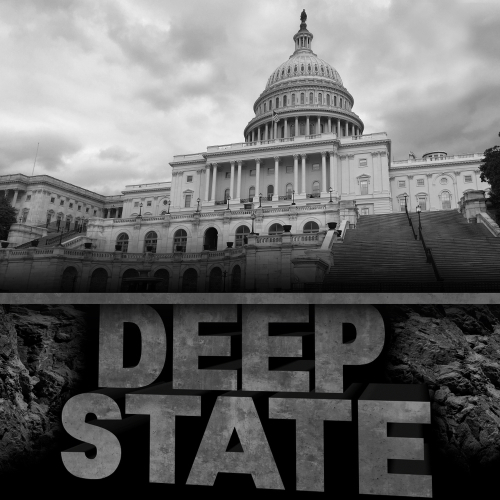 The Deep State is determined to get rid of Trump. They desperately want one of their own in power — a team player. (1) The targeting/framing of Michael Flynn and the positioning of a false narrative around innocuous Russia contacts. (2) The use of Joseph Mifsud as an asset by the CIA/FBI running a counterintelligence operation against the Trump campaign. (3) The Trump Tower meeting as organized by Fusion-GPS. Additionally, for the first time Devin Nunes confirms that it was Robert Mueller who blocked delivery of documents to the House investigative committees. While this might be old news to CTH readers, this confirms our earlier research. It was Robert Mueller and Rod Rosenstein who were protecting DOJ interests by using the Russia-probe as a shield. That’s why Chicago U.S. Attorney John Lausch was essentially an exercise in futility (and he was never heard from). With Nunes confirmation that Mueller used his probe to keep congress away from documents adverse to his interests…. that increases the likelihood Mueller deployed the same strategy with IG Michael Horowitz (as earlier reported); and only after Mueller was completed was the IG office allowed unfettered access to evidence…. hence, the delays.